We have carved a niche amongst the most trusted names in this business, engaged in offering a comprehensive range of Cast Iron Balcony Railing. We are a reckoned organization in this domain and are indulged in providing an enormous quality range of Cast Iron Railing Post to our customers. 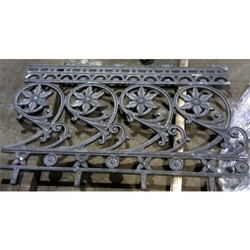 This Cast Iron Railing Post is mainly used for supporting railings. Apart from this, these products are made by our vendors using fine quality cast iron and latest machines.